We are in the Kyoto city of Japan. 5 minutes on foot from Tanbaguchi Sta. of JR Sagano-line. Room 609 of KRP9. Telephone number is +81-75-321-7300. Go out straight of ticket wicket of Tambaguchi Sta. of JR. Then you see main street (Gojo St.). Turn left and go to the direction of the left hand (west) according to the street. Walking for a while, you see "Kagonoya" over pedestrian crosswalk. 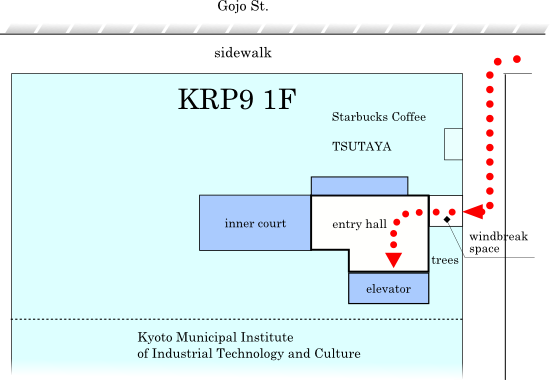 Crosssing at the crosswalk, and passing by "Kagonoya" and "Starbucks Coffee", you see KRP9 (KRP Bldg. #9) on the left hand. Turn left to a pathway short front of KRP9. Go straight a bit, you will see the entrance of KRP9. Entering in the entry hall, there is an elevator on the left hand. Please go up to 6F with the elevator. Get off the elevator and you see a gate to the front. Gate is locked. Call us over the intercom on the right of the gate with our room number 609.